Special Offers from Discount School Supply®! : Tables and Chairs Deals to Floor You! Tables and Chairs Deals to Floor You! Discount School Supply may be best known for our budget-friendly deals on top quality Arts and Crafts, but did you know that you can save big bucks at Discount School Supply on durable early childhood classroom furniture as well? 13" BaseLine® Chair FOR ONLY $29.95! BaseLine® chairs are manufactured by Angeles®. They are so lightweight that even kids can handle them with ease. These stackable, easy-to-clean chairs have a molded plastic shell and PVC legs. Leg boots reduce noise and prevent rust. 5 year warranty. Chairs are solid in color and available in 10 colors. 24" x 48" Rectangle Scholar Craft™ Activity Table FOR ONLY $69.95! Extremely durable from the top down, Scholar Craft™ tables are designed and constructed for years of reliable service and good looks. Each table features thermo-fused melamine work surfaces that are resistant to stains, chips and scratches. The 1-1/4" thick, non-porous tops are easy-to-clean and table edges are safely protected with heavy-duty vinyl T-molding to prevent dents and scratches. Includes a 5-year limited warranty. 13 1/2" Scholar Craft® Stacking Chairs with Chrome or Matching Legs FOR ONLY $22.95! These child-friendly, comfortable chairs feature a heavy-duty, high-density polyethylene shell with a special additive that dissipates annoying static electricity. The child-safe air vent provides seating comfort and a convenient handgrip for ease of movement. Chairs can be stacked 20 high in a crisscross pattern or set upside down on a table. Includes a 10-year limited warranty. 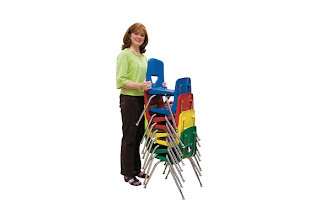 Find more money-saving deals on classroom tables and chairs right now at Discount School Supply. In fact, you could get an Angeles® Table and Chair Set for FREE! Yes, FREE! Celebrate Discount School Supply's 25th Anniversary with us and you could win a FREE Angeles® Table and Chair set during our BaseLine® Table and Chair Giveaway. Wouldn't a FREE Angeles® rectangle table and 4 matching chairs be great? To enter the Table and Chair Giveaway, click here right now. But enter today! This Giveaway ends September 10th! Shop Discount School Supply for all your early childhood education essentials. Moms, dads, teachers and caregivers save everyday on Arts and Crafts, Manipulatives, Curriculum Resources, Active Play, Dramatic Play and, of course, Furniture! Save more at Discount School Supply right now during Back to School and who knows, maybe you could win a FREE Angeles® Table and Chair set! Click here for more info! Time Running Out to Save Over 25%! How to Get the Same Supplies for LESS $$$! Last Chance for 25% OFF on 25 Favorites! Value Line Furniture Ships FREE & FAST! 25 Products for Under $5!